Faustin Linyekula’s self-reflection in Le Cargo displayed his emotion and raw storytelling ability through this dance performance. 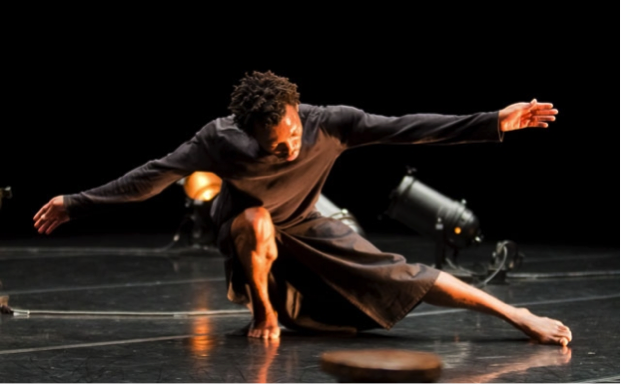 Taking on a multidisciplinary approach, Linyekula’s ability to communicate his past through dancing, singing and talking had the audience entertained for what was to come next. The most prominent method in his work was the use of repetition through his storytelling and song. Watching this piece I couldn’t help but feel touched. One can tell his background comes from a place of genuine struggle and the desire to achieve more. He became a ‘storyteller’, where he had the opportunity to take his story farther than just his homeland of Congo. The manipulation of his story telling through the multidisciplinary performance portions, was blatantly the main context for the creation of his piece. Linyekula used the majority of the beginning of the performance to vocalize his story, explaining more or less what he was about to present to the audience. The storyline left me expecting an element of surprise further into the piece but rather the hype of the story was left in a stagnant place, the story never developed. He said what he needed to discuss: his family, the living conditions he experienced while growing up and how his storytelling had changed his life for the better. Although emotive, there was no climax or space left for him to develop the emotions through his movement or singing. If the story was removed and the text was based on a random topic, the piece overall would have fell flat. It’s unfortunate his work relied so heavily on his storytelling, rather than having movement as an element to support and flourish his story. In contrast to this, the other elements Linyekula incorporated did not override the image he was hoping to portray. A simple black costume, six floor lights, and three extra props including two books and a statue/stool didn’t distract from what other sounds he was expressing. The use of lights allowed for the piece to come to a close and make a statement about his journey because the lighting design was so prominent. Linyekula’s ability to command the stage as a solo artist was empowering. He didn’t choose to incorporate many extra elements in hopes of hiding himself or finding companionship on the stage. He held his own ground, taking into consideration the props he brought on stage were an asset to his own work, rather than making them the focal point. Linyekula’s work was unfamiliar to me prior to observing Le Cargo, and I’m intrigued to discover how he can take his storytelling beyond this piece of work. It seemed as though his piece had a beginning and an end; his whole life path was described. I wanted, as an audience member, to build a deeper relationship into what he had to offer but Le Cargo left me with the impression there wasn’t much more to dive into. I have compassion for his choice of experiencing vulnerability on the stage and emotionally opening up about his upbringing with the audience. His composure made me sympathise with what he was telling, but his piece left me visually unimpressed. His culture and worldly experience influence how his body reacted to the response he was giving by incorporating movements from other areas. If described as a multidisciplinary storytelling work, I would have anticipated less physical structure and more cohesiveness between acts. Le Cargo’s lasting impression left me with an experience into a culture unfamiliar to my knowledge, but I was unimpressed in the context of movement. Linyekula’s body expression is mediocre in comparison to the expertise of speaking and singing he expresses. The expectations were for an extravagant culture to be expressed on the stage and when the piece ended for a shift in culture understanding to have been exposed to the audience. Although, I was touched by his background, I wasn’t left overly impressed with his choice in movement composition or repertoire of transitions. His presentation had the opportunity to let his story be told through silence rather than blatantly through the words he had chosen to speak. Instead of unplugging the six large lights on the dance floor three quarters through the piece, he could have incorporated movement to make the action more substantial. As a solo performer, all we had to focus on was him, there was nothing else to draw our attention to. Linyekula’s concept choreographed on bodies besides his own, would have had the potential to elaborate his story with more people involved. Having no mutual desire throughout the audience to give a standing ovation at the end left the impression his story had not been properly portrayed. My expectations were set high for a culturally moving experience that resulted in a mediocre effort to meet this possibility. “Faustin Linyekula | Studios Kabako” National Arts Centre. N.p., n.d. Web. 26 Feb. 2015. <http://nac-cna.ca/en/event/8391&gt;. “Le Cargo.” PuSh International Performing Arts Festival. N.p., n.d. Web. 26 Feb. 2015. <http://pushfestival.ca/shows/le-cargo/&gt;.